The title "currently loving" is misleading this week as I have always kept my eye on classic ladylike pieces such as these for as long as I can remember, anything that falls under the category of "things Grace Kelly might wear". She always looked so elegant and timeless. I personally wouldn't mind looking back on my life in photos without cringing and wondering why in the world I would wear that... thing. So today in honor of Grace Kelly's birthday I have rounded up a few modern pieces with her in mind. I can't decide what I love more, the idea of wearing a cape or long suede gloves beneath it to warm my arms. Wearing gloves is one of the things I look forward to most about the winter. I would keep the rest of the outfit simple but still polished with matching suede heels, a ladylike bow blouse, and a structured satchel. 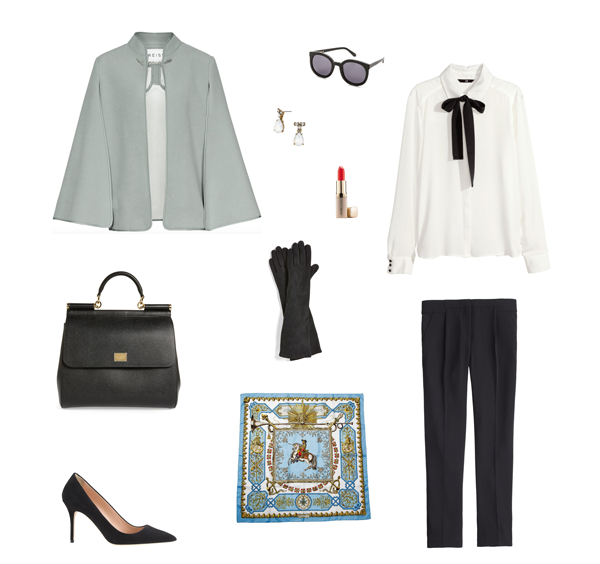 And for a little extra Grace, an Hermes silk scarf and red lipstick named for her. Love that cape- so elegant!! I'm not sure you could have put together a more elegant look!! The tie on the blouse is perfect!! I'll take it all! That cape is AMAZING!! I absolutely love this! Oh my goodness! So PERFECT! You could never go wrong with this chic, timeless look! Dying over that cape!! This outfit is serious perfection. I need it all in my closet ASAP! Also, I now have "State of Grace" by TSwift stuck in my head! Absolutely love all of these pieces! The blouse is so classic and stunning. This is amazing! Every single piece! It is very lady like and classic. I especially love that bag!